A huge influence in the sport of BMX, vert legend Mat Hoffman is known to the world as The Condor due to his monstrous airs. Now he's immortalized in the documentary "Birth of Big Air," which premiered over the weekend in New York City. 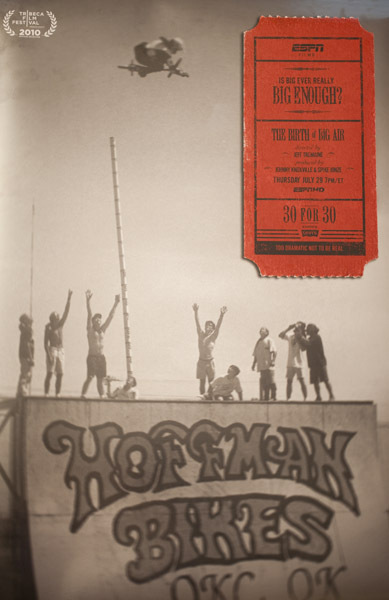 Directed by Jeff Tremaine and produced by Johnny Knoxville and Spike Jonze, the movie revisits how Hoffman figured out how to tow-in to a huge ramp with a beat-up motorcycle, just to go bigger. "I just learned to stop thinking and let my heart guide me," Hoffman said. "And that's just where it guided me, is hitting a ramp really fast." Dew riders Dennis McCoy and Mike Spinner were at the premiere and Kevin Robinson has some commentary in the video. At the premiere, Vital BMX talked to Hoffman's dad, who used to be a basketball player in Indiana. His dad recalled his son telling him, "I got this other thing in me. I just wanna be a gladiator and I want to go for it." His dad was a huge support to his son's career. Hoffman was one of the first to do a backflip on a BMX and the first to pull off a no-handed 900, which earned him X Games gold in 2002.